I am going down to the bone. A deep cleanse, a stripping away – like a diamond cutter chipping away the grit to reveal the sparkle. 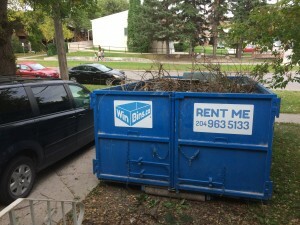 This week, there was a large dumpster parked in front of my house. In went the old couches whose springs no longer held their shape. Then the detritus collected in our garage over the eighteen years we’ve lived here. Broken broom handles, kept just in case there might be a use for them some day. Bent tools, old bicycle tires, empty cardboard boxes. Next came the branches I’d trimmed from the shrubs and trees in the Spring, a broken bench, a rusted table from the backyard, and old playground toys long abandoned by grown children. Finally, I stripped the floors in two-thirds of the house and dragged those out onto the growing heap in the dumpster. Each room took a little more effort than the last and each increased effort caused a little more wear and tear on my body. First I pulled out the stained carpet in the living room and hallway, the padding underneath, and the strips of upside-down nails at the edge that held it in place. Then the warped cork floor came out of the bathroom. 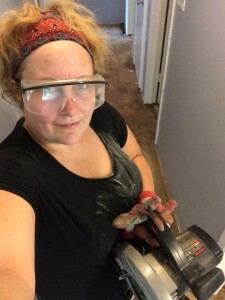 The kitchen, with its subfloor and multiple layers of linoleum increased the challenge, but I was up for it. After watching DIY Youtube videos, I set the circular saw at the right depth, put on safety goggles, and cut it into pieces. Then came the prying, the jockeying of appliances, and the endless nail removal. The entrance, with parquet wood glued solidly to the floor, is challenging me most and it’s the only room that remained uncompleted when they picked up the full dumpster yesterday. Why have I done this all alone? Multiple reasons, I suppose. Cost is probably the first factor, but there are more. I wanted to prove to myself that I could – that I was strong enough and capable enough and stubborn enough and fierce enough. And I knew that it would be cathartic – to work out through my body some of the stuff that gets stuck in my mind. I was right on both counts – today, though my body aches, I feel strong and fierce and a little more healthy. And there were other reasons – deeper reasons… Like the fact that I had some shame about the state of my house and didn’t want anyone to see the stains on the carpet, the layers of grit under the carpet, or the dried bits of food stuck to the floor under the fridge. Or the fact that I felt like this was my work to do – to cleanse this space of the brokenness of the past so that my daughters and I have a new foundation under our feet for the next part of our lives. Eighteen years ago this month, we moved into this house with two toddlers. Since then, the floors have taken a lot of wear and tear – spilled milk, spilled wine, spilled tears, spilled blood, spilled lives. We sprayed and scrubbed and sprayed and scrubbed again, but carpets can only take so much, and eventually the stains were so deep it was hard to know the original colour of the carpet. We didn’t change the carpet, though, because we had hopes for bigger changes. Fourteen years ago, we drew up plans to add a big new kitchen onto the side of the house. There was no point in replacing floors, we told ourselves – we might as well do it all at once. So we put it off until we had the money. But then we started making choices that pushed the renovation plans further and further into the future. First, Marcel quit his job to go to university and be a stay-at-home dad. Then I took a pay-cut to work in non-profit instead of government. And then I took an even bigger leap (and pay-cut) and became self-employed. The money was just never abundant enough to justify a big expense like a new kitchen. Instead, we lived with ugly floors and a cramped kitchen. Sadly, though, that changed the way we felt about our house. We put in less and less effort to keep it clean and we invited fewer and fewer people over because the house never looked the way we wanted it to look. But the floors weren’t the real problem. Perhaps, in fact, they were simply a reflection of the deeper problem. There were stains in our marriage too, and no matter how many times we tried to scrub them out, they kept popping back up again, revealing themselves to us when the light shone through at the right angle. The stains were harder and harder to ignore, and we finally knew that, just like the floors, we had to tear apart our marriage to see whether the foundation beneath it was strong enough to warrant salvaging. We tried to renovate – visited multiple counsellors over the course of a few years – but finally it was time to make a hard decision. The marriage was too broken to fix. It was better to release ourselves from it so that we each could find our way to growth and healing. Last October, he moved out, and I started decluttering and painting. The flooring, though, had to wait until we’d signed a separation agreement and the house belonged to me. 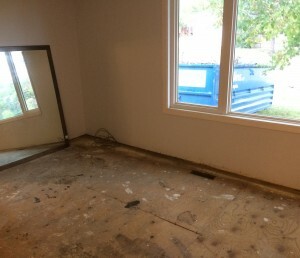 Now, as I wait for a contractor to install the new flooring (my DIY abilities only take me so far – it’s good to know when to call in the professionals), we walk on bare wooden floors in empty rooms. Our voices echo against the walls in all of this hard space. It’s all been stripped to the bone – myself, my house, and my marriage. Unlike the marriage, the foundation of the house is still sturdy and strong. Only a few places need attention – where it squeaks, new screws will be applied. Soon it will be built upon to create a safe and comfortable home for the family that lives here now – my daughters and me. We’ll begin to fill it with laughter again, and when there are couches with sturdy springs, we’ll welcome friends to sit with us and hear our stories. And when we spill, we’ll mop up the spills and carry on. We had to let go of dreams along the way – the new kitchen never materialized and the family isn’t the shape we thought it would always be – but we are sturdy enough to survive and resilient enough to adjust and grow new dreams. Despite the dismantling of the marriage, our family still has a solid enough foundation to hold us. My own foundation is strong too. In fact, it feels stronger than ever. All of this chipping away is bringing me closer and closer to my essence, to the diamond under the grit. I’ve cleared out what didn’t serve me anymore, I’ve put some new screws in place to fix whatever squeaked, and I’ve called in professionals when that seemed wise. I feel fresh and alive and ready to hold space for whatever wants to unfold next in my life. The liminal space has been hard and painful and I still ache from the effort it’s taken. Some of the tearing away revealed grit and shadow I didn’t want anyone to see, not even myself. But in the end, there is grace and the light is shining through and it is all worth it.